I am still dreaming of oysters and beignets from New Orleans. 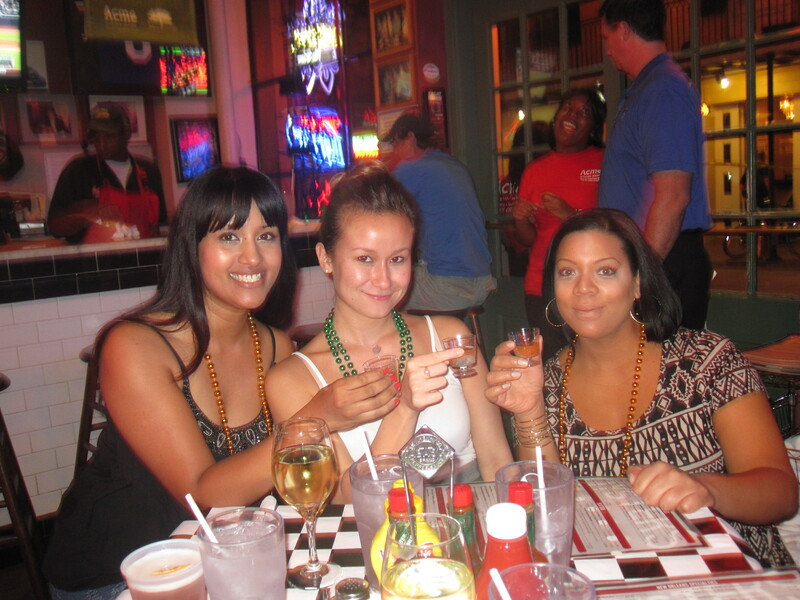 In case you missed it, please check out my previous posts about my trip to New Orleans. I let you know about the hotel hits and misses that my friends and I encountered as well as some amazing entertainment options in NOLA. 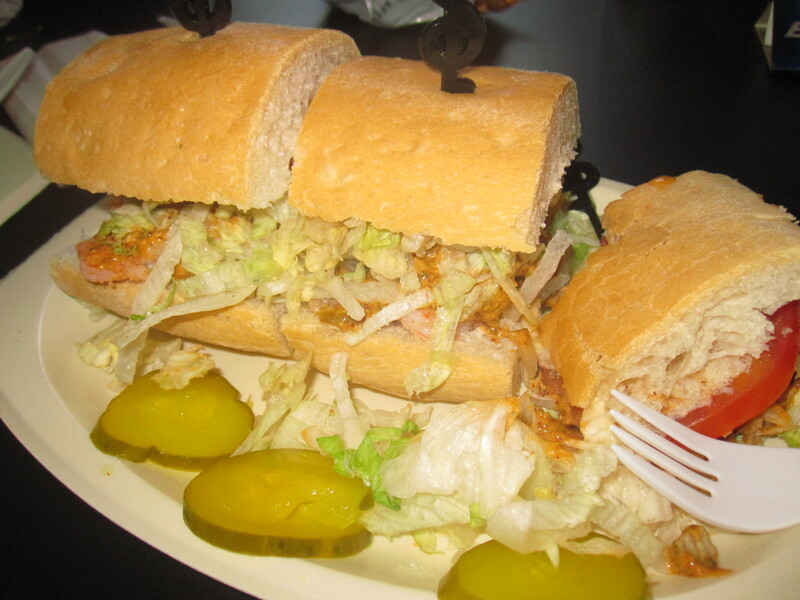 New Orleans is known for its legendary po-boy sandwiches. So, naturally it was our first stop when we arrived. po-boys are named for the fact that they were sandwiches that people with not much money originally made from dinner scraps. I thought that Po-Boys were always made with seafood, but we saw all kinds of po-boys around the city, including ham , turkey, beef, meatballs, pulled pork and smoked sausages. Seafood choices included catfish, grilled oysters and shrimp. 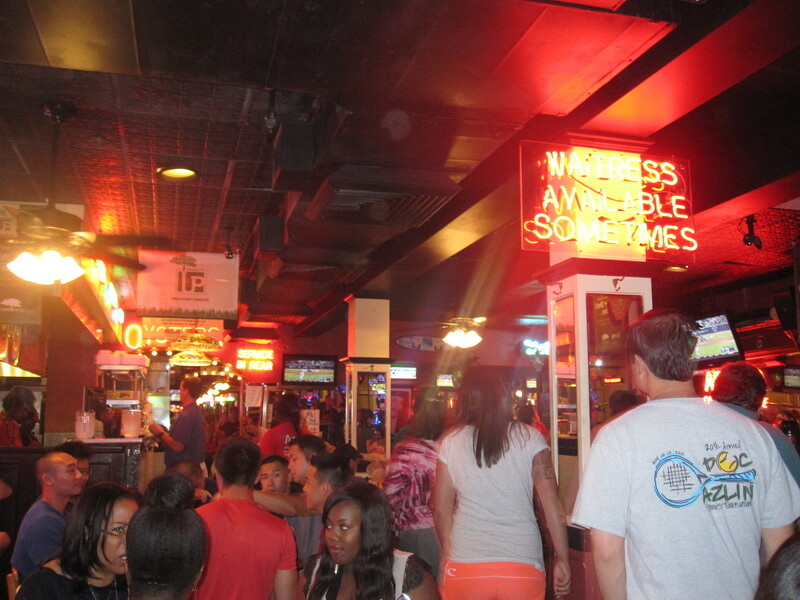 We went to World Famous Court Tavern Po-Boys on Bourbon Street for our first Po-Boy experience. Three of us decided to share a shrimp remoulade po-boy as well as another kind of sandwich, a muffaletta. Remoulade is a cold condiment from France, that often features chopped pickled veggies and herbs. The shrimp remoulade Po-Boy was $12.00 at the Court Tavern. 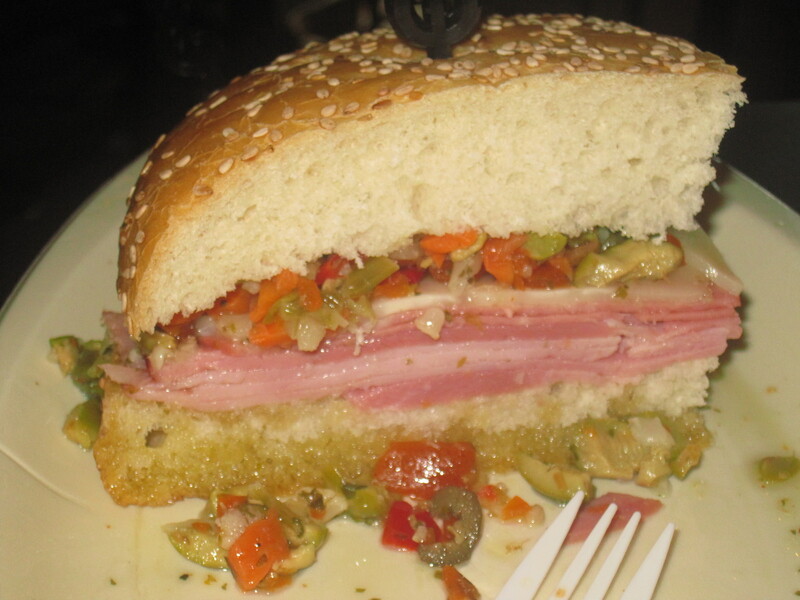 A mufaletta is traditionally a loaf split horizontally and stacked with marinated olive salad, mortadella, salami, mozzarella, ham and provolone. A half sandwich was $10.00 at the Court Tavern. These sandwiches were no joke. You can see from the after picture that we attacked them. 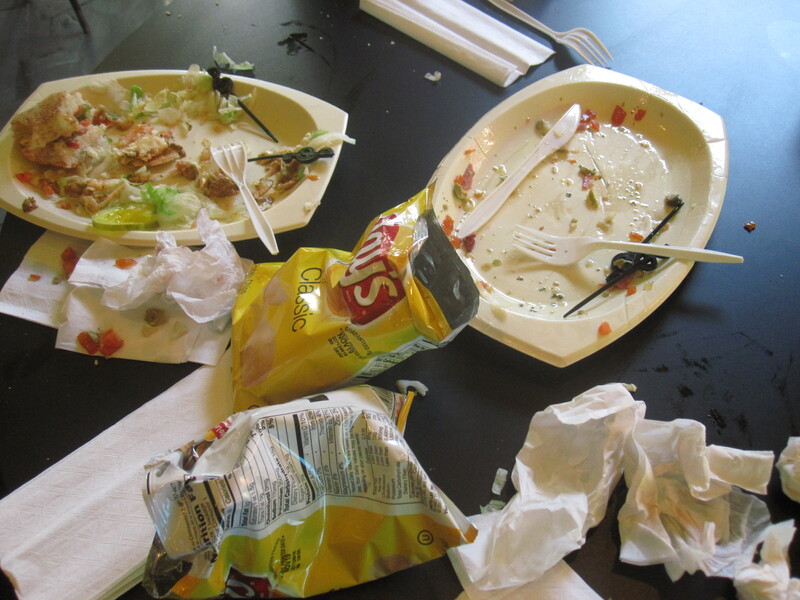 My favourite was the shrimp po-boy. I love seafood and the salty pickled veggies were so delicious. We loved the muffaletta as well, but we found that the bottom piece of bread ended up soaking up alot of the oil from the olive salad. So, it was a bit messy and oily at the bottom. Cafe du Monde is a famous French Cafe on Decatur Street in the French Quarter of New Orleans. 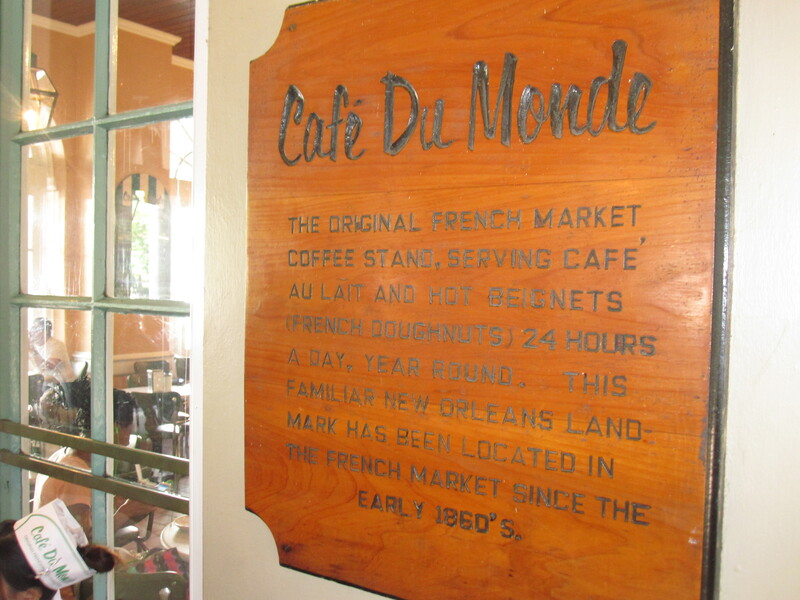 They are well known for their cafe au lait and french style beignets. The coffee is blended with chicory in New Orleans style. Coffee and chicory was developed by the French in the Civil War when coffee was scarce and it was found that chicory added body and flavour to the brew. 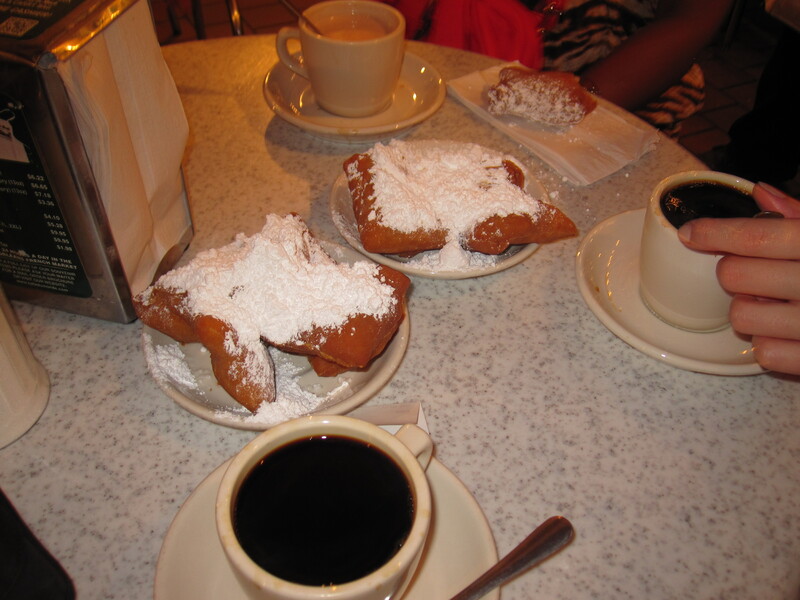 Let me just tell you, the chicory coffee with a beignet ( or two) was a match made in NOLA heaven. 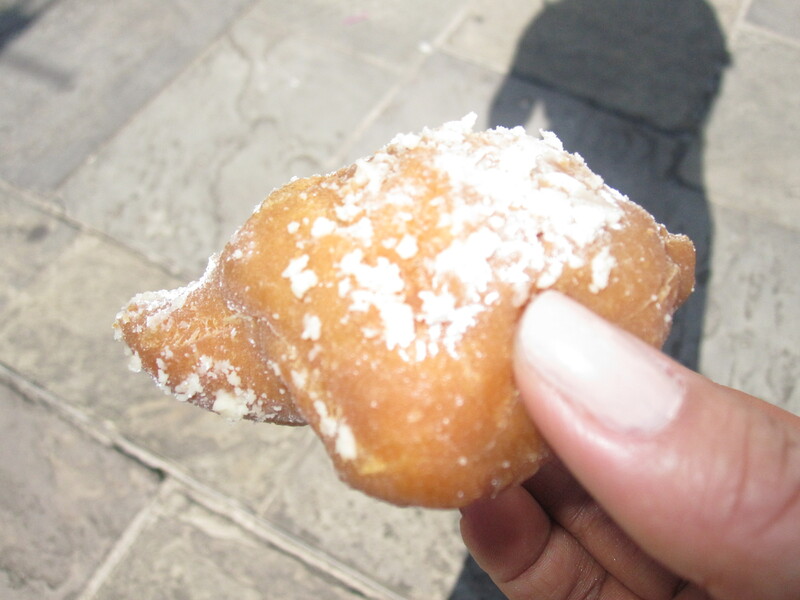 The beignets were served fresh and hot, covered in powdered sugar. Surprisingly, they were not too sweet at all , just chewy and delicious. Just imagine the best doughnut you’ve ever had in your life. Although, describing them as doughnuts just doesn’t do them justice. Beignets are sold 3 for $2.75. At first we wondered why they don’t sell singles. Now we know it is because you can’t eat just one! The coffee was also delicious. The smell alone was incredible. I didn’t try the cafe au lait, just black coffee. So, so good and I have been craving a cup ever since. You can also purchase cans of Cafe du Monde chicory or French Roast coffee to roast at home. 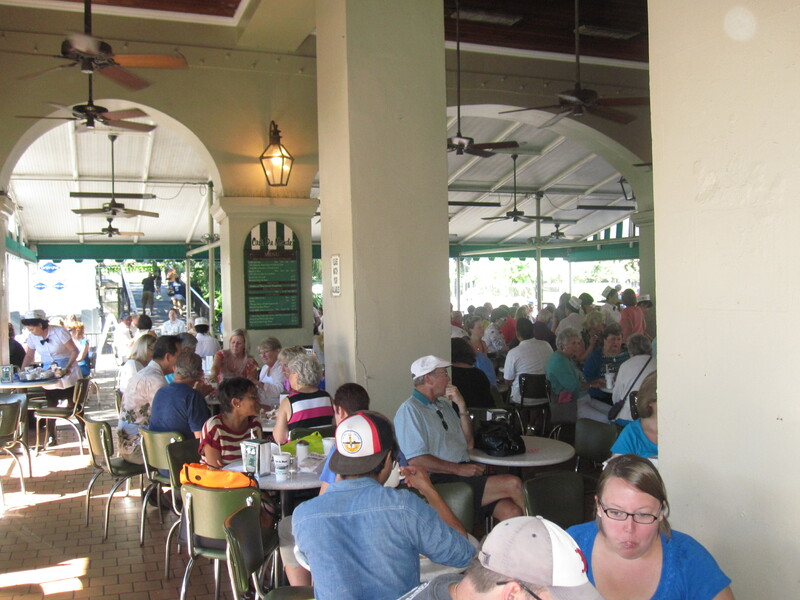 Cafe du Monde is open 24 hours a day, 7 days a week with the exception of Christmas Day. We took advantage of this by heading there for decaf and beignets in the early morning hours after partying on Bourbon Street! My sister is a trip planner extraordinaire. She reads loads of reviews and prints out lots of info before trips to find the best places to go. Oceana was one of her finds, and she thankfully made resos for all ten of us to go for dinner. Oceana is a huge two-story restaurant located at Bourbon and Conti streets. Oceana is casual and family friendly while still being more upscale than some of the other restaurants on Bourbon. 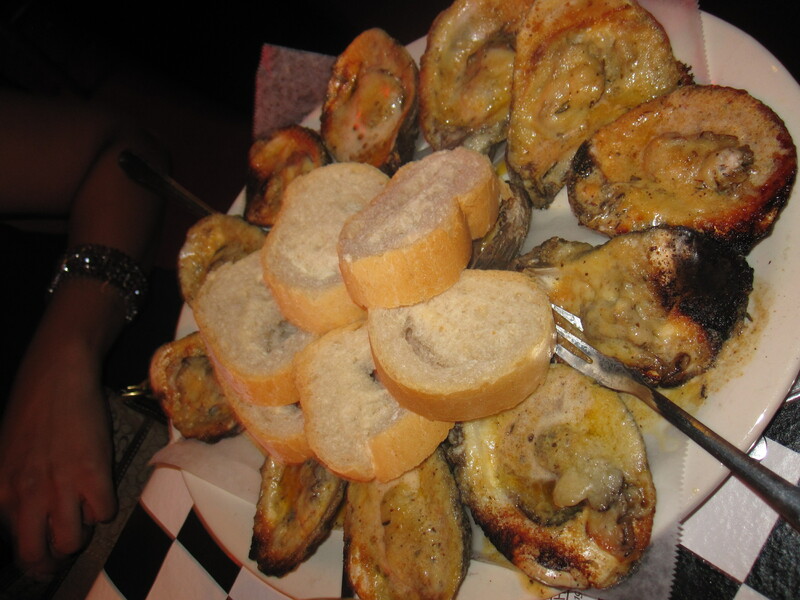 The menu is extensive and features incredible seafood dishes, steaks, gumbo, po-boys and an oyster bar. In addition to the regular menu, there are also daily specials. For appetizers, our group tried a variety of things, some being a bit unusual. 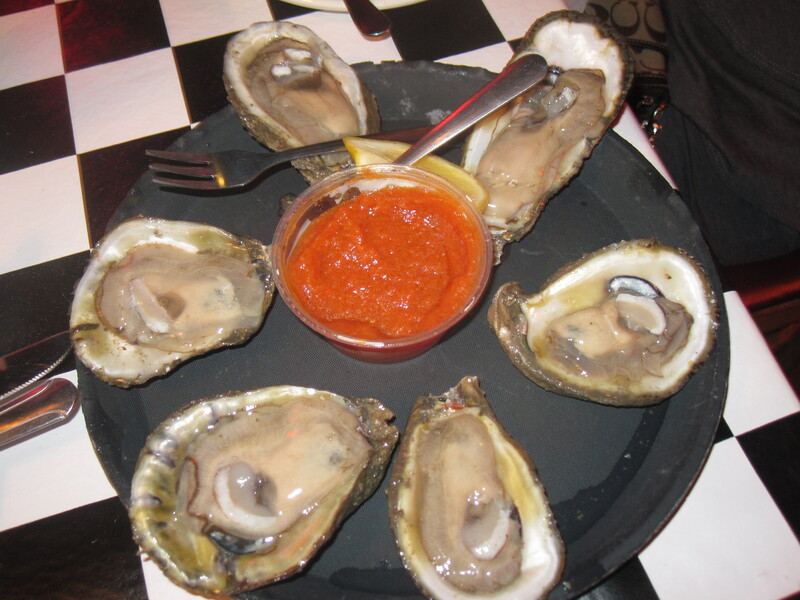 My favourite , of course…raw oysters. Yum! 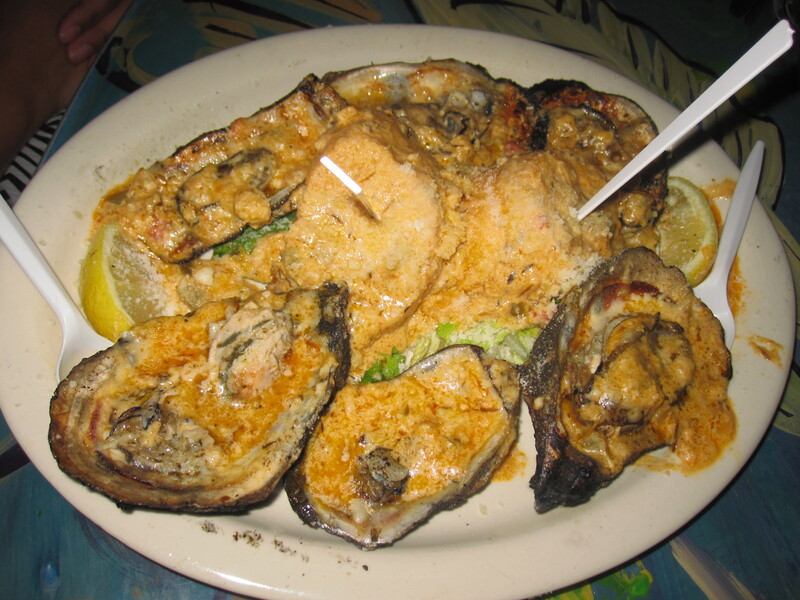 Our table also had some yummy char grilled oysters with zesty garlic and creamy Cajun sauce. 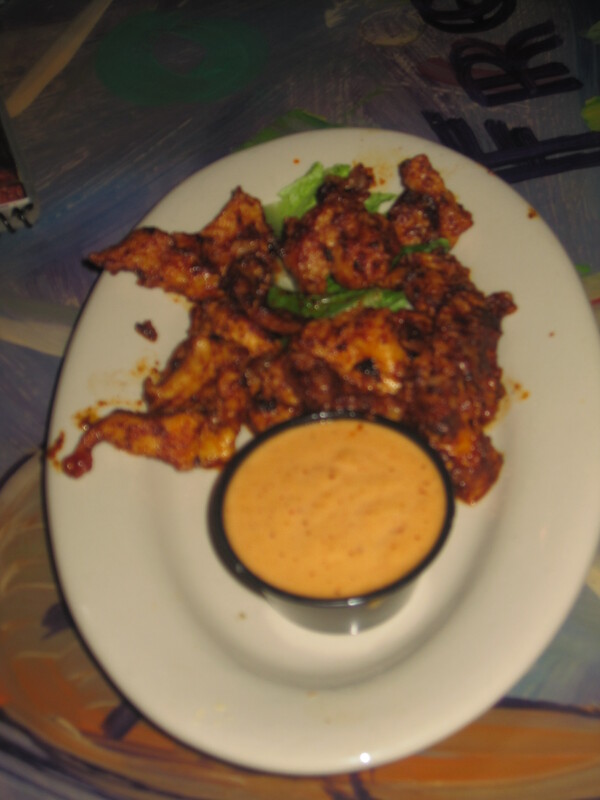 I mentioned some unusual choices…blackened alligator anyone? The alligator reminded me of a tougher chicken. It was seasoned so well though. The blackening on this reminded me of jerk seasoning…really tasty! 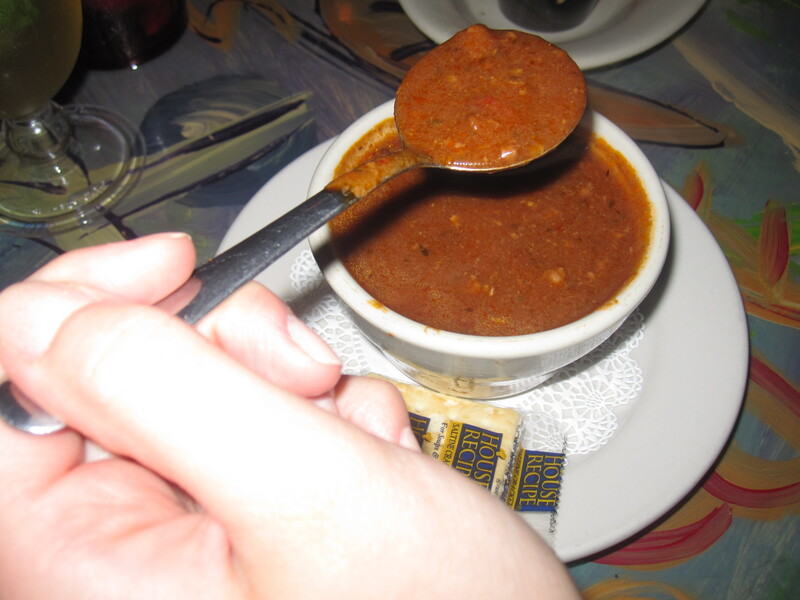 How about some turtle soup? It tasted like chili if you’re wondering about this one. For main course, we went a bit more traditional. No gators here. My sister and I split two main courses so that we could try different things. 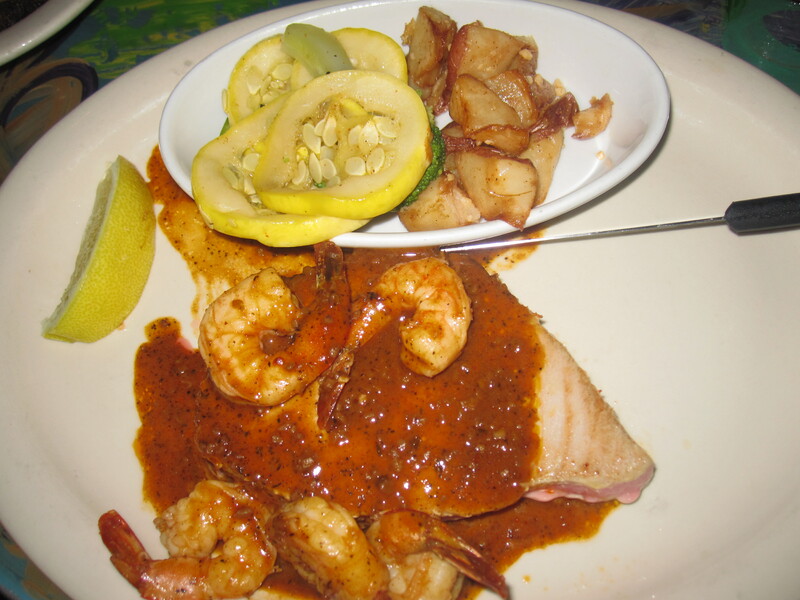 Grilled Ahi Tuna ” La Boheme” topped with New Orleans style bbq shrimp, served with sautéed veggies and garlic potatoes. Blackened Catfish Platter with the same sides ( actually comes with jambalaya, but my sister is vegetarian, so we substituted veggies instead). 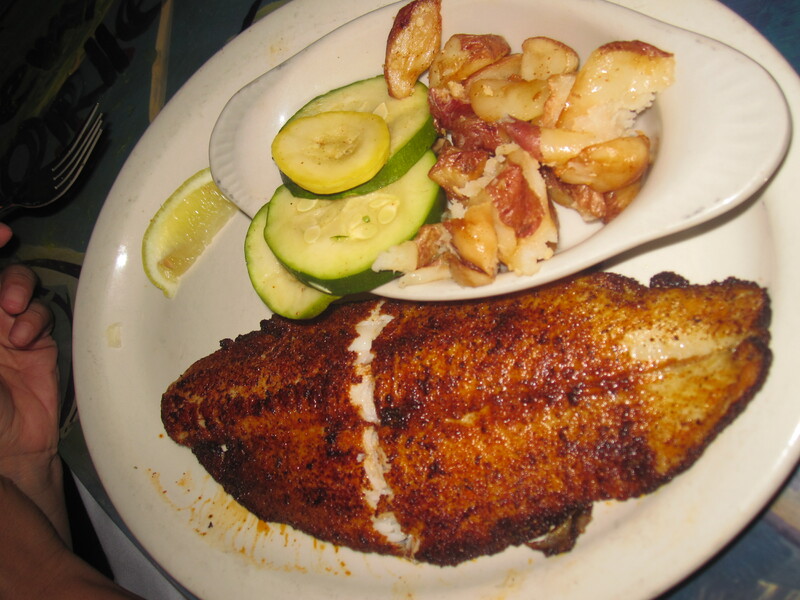 The catfish was the best I have ever had, perfectly cooked and expertly seasoned. The tuna was ok but paled in comparison to that catfish. 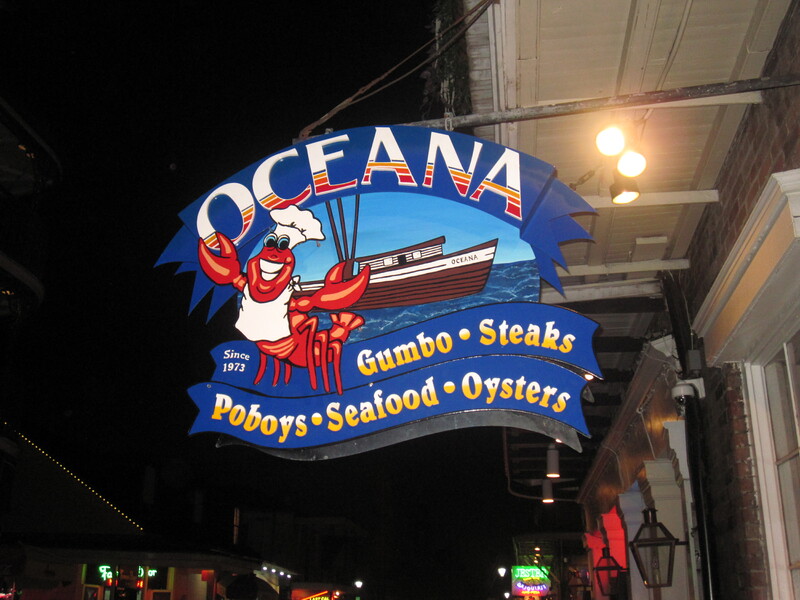 Our whole group thoroughly enjoyed the Oceana Grill and would return on any trip to New Orleans. It was also reasonably priced with all meals falling under $25.00. 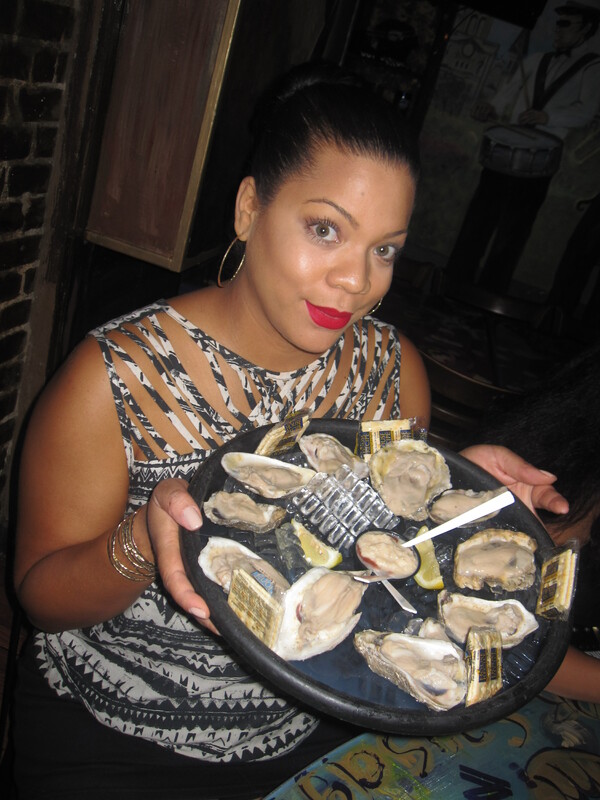 Acme Oyster Bar is a New Orleans favourite , and it was a must try for us. We arrived one evening to find a lineup outside of the restaurant, must be a good sign right? The line actually moved fairly quickly and we were seated in about 30 minutes. This resto is super casual and fun. 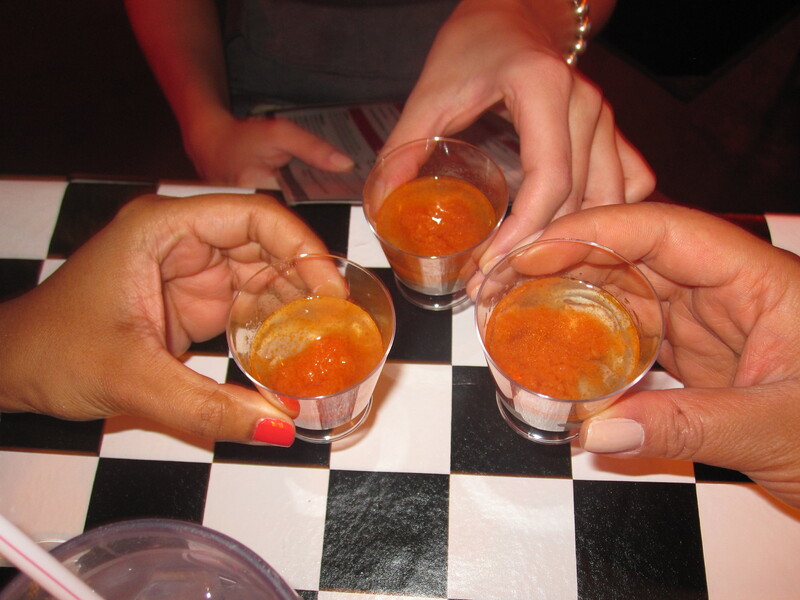 We began with a round of oyster vodka shooters. Cheers! Of course, we had to start our meal off with more oysters, both grilled and raw. They were so delicious that we ended up ordering more! Warning- you’ll be hard pressed to find healthy eats at this place. I asked if they had side salads and the server actually laughed at me. I had deep fried soft shelled crab with sweet potato fries and hush puppies. What are hush puppies, you ask? Deep fried corn bread…served with butter of course. YOLO! The crab was absolutely delicious. I am salivating thinking about it now. Acme was a definite win. We were really disappointed when we got to the airport to come home because the airport location of Acme has closed. We were hoping for one last oyster fix. On our final morning in NOLA, we went to a little resto called Eat for brunch. Eat is a very small restaurant with a really clean and modern esthetic. It is BYOB, a really nice feature that we didn’t take advantage of since, you know…it was 9am and all. 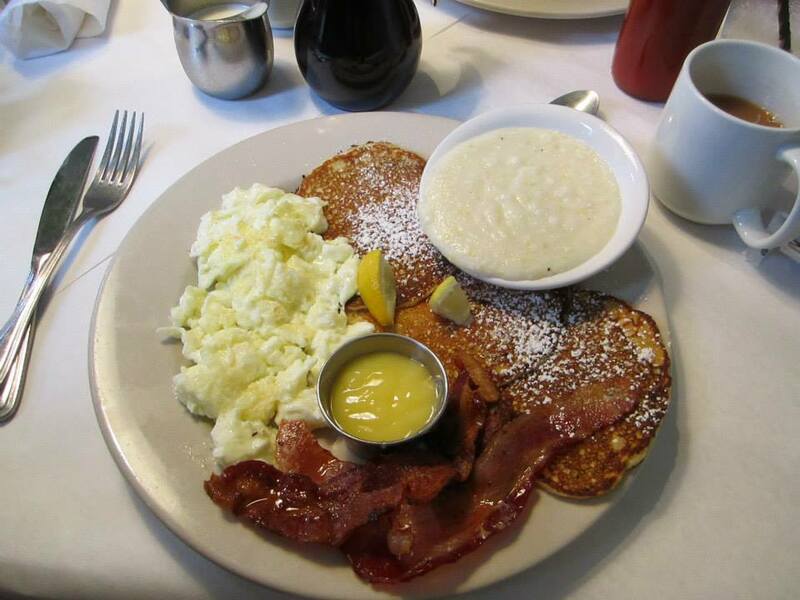 Brunch is served at Eat on Saturdays and Sundays until 2pm. Chef Jarred strives to make local family favourite dishes. 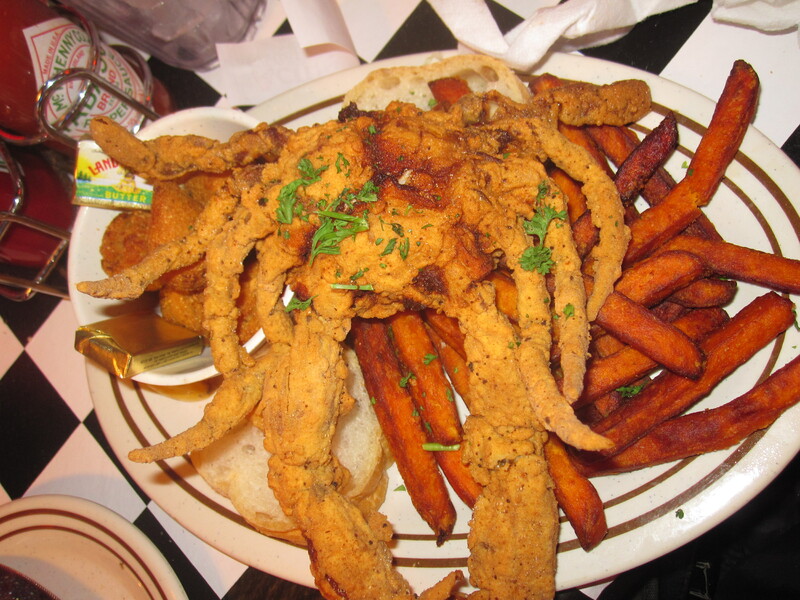 They use local seafood and produce whenever possible to support Louisiana fishing and farming industries. Sounded pretty delicious, and we were definitely ready to Eat. The brunch menu was delicious and extensive. It featured such delicious choices as pulled pork cake with eggs, fried green tomato breakfast platter and southern biscuits with gravy. The starters sounded just as delicious. They included fried okra with blue cheese and blue cheese and fig torte. However, we chose to try some of the specials, rather than the regular menu items. 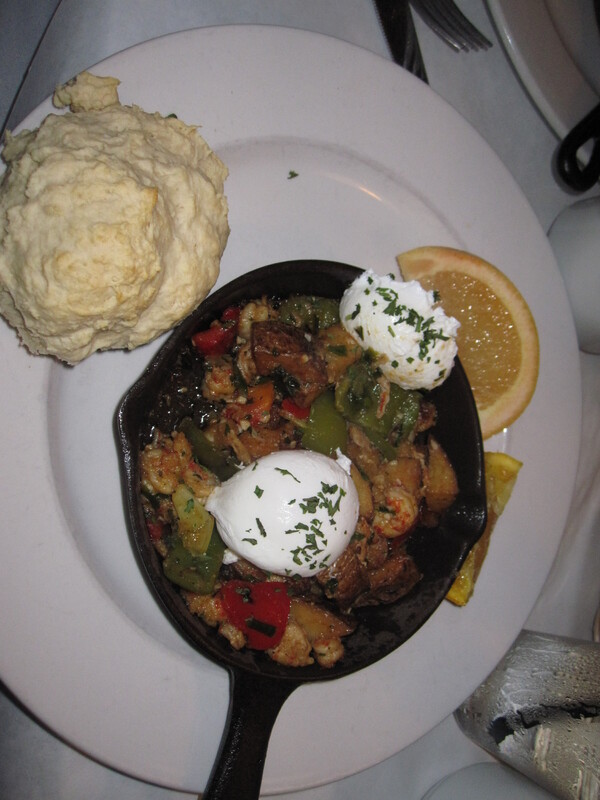 Crawfish hash was so yummy, served spicy in a skillet with potatoes and veggies. Fluffy pancakes were served with tart lemon curd. Eat was absolutely delicious. I’m starting to sound like a broken record, I know but the found in New Orleans was just that amazing. Before I sign off from my good eats in NOLA round-up, can I just let you know that I put this mouthwatering post together whilst on day 7 of a 10 day juice cleanse? Can you say, TORTURE? That’s it for my New Orleans series of posts. I absolutely loved everything about this incredible city and am so glad that I have TNL to share my experiences.If you’ve been to NOLA, or plan to go in the near future, I want to hear all about it! The food was SO GOOD!…and I don’t know if it was just the wonderful atmosphere of NOLA, but everything tasted like the best home-cooked, comfort kind of meal I’ve ever had – no matter how exotic it was. The food is yet another reason to miss that magical place. I’d never had a beignet before Cafe du Monde, and now I know why they are considered the best. I feel like if we had the same food here at home, it wouldn’t be the same though – there is just something special about NOLA. I really enjoyed reading this post – it made me feel a little homesick for a place that isn’t my home, but is definitely in my heart. I am hungry just reading this! Imagine writing it while on a juice cleanse! Eeek. As much as I love weird food, my heart just breaks when it’s alligator or turtle! Hi Vanna! This makes me so happy! I know you will absolutely fall in love with New Orleans just as I did. Have a fantastic trip , and please eat a beignet ( or 20!) for me!